Do you dread the process of buying a new car? This is something that should be fun, but somehow, it seems a lot scarier than it should. That’s probably because we’re all afraid of getting ripped off. Saving money at the auto dealership gives you personal satisfaction and bragging rights. Someone will always ask what you paid for your vehicle. Can you tell them you got a good deal? You can talk about your new car purchase with confidence when you use these 6 techniques to help you save money at the auto dealership. Everyone does a little research before buying a car, but you may have to do a bit more digging than you think. Start by figuring out what kind of car you want. You could end up paying way too much based on the wrong car choice alone. Make a list of features that are important to you and research the cars that are high-rating for those features. Narrow your selection down to 3 cars within your price range. Now, it’s time to research costs. You can use a service like TrueCar to find out what people in your area are paying (or you can use KBB or NADA for values). Just be sure to price the cars with the features you want. Once you’ve narrowed your selection, call your insurance company to find out what it would cost to insure each vehicle. You might be surprised at how much different makes and models can vary in price. This will impact your monthly or yearly auto spend, so it’s an important factor. 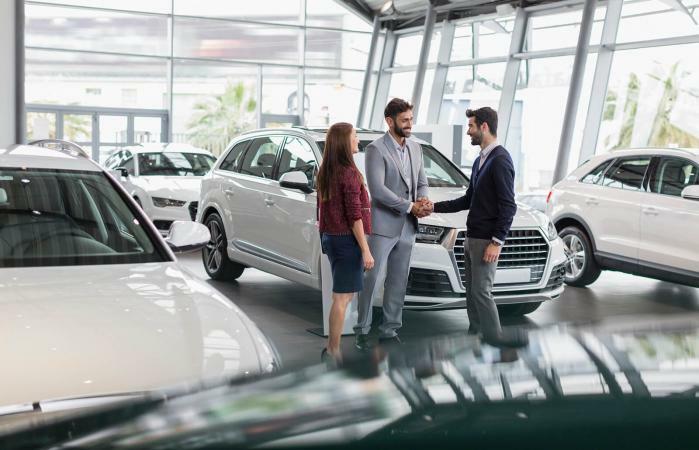 You don’t want to let the car salesperson persuade you to purchase a different vehicle that might cost a lot more to insure. Don’t start talking about your new vehicle purchase before you negotiate a value on your trade. You should walk into the dealership with an estimate of what the car is worth (You can get that on KBB.com or NADA.org). Only when you’re happy with the trade-in value should you start talking about your new vehicle needs. Don’t let a fast-talking salesperson sway you in the other direction. This is important. Dealers often have specials that change monthly, so they can unload some slow-moving or overstocked inventory. So, before you test drive anything, ask about the specials. Dealers will often talk about this when they get to financing, and things move quickly and can get confusing from there. Now is a good time to ask about specials and to make sure you understand the potential savings. Dealers even have specials on used cars, so don’t be afraid to ask for their CPO vehicle specials. It’s easy to get wrapped up in the emotion of buying a new car. There’s the new car smell, shiny new paint and cool features. But none of these things should enter into the negotiation. In fact, you should take a minute to clear your mind after the test drive and look at the numbers before you start negotiating. The salesperson’s strongest bet is that you won’t walk out without this car you love. Take that away and you’ve regained the upper hand. Of course, that means you must actually be willing to walk away. It’s a balance, but know that this isn’t the only car or dealership in town. If you’re financing your vehicle through the dealership, they’re probably going to try to work from a monthly budget perspective. And while this almost seems to make sense, it’s crucial that you steer the conversation away from monthly payments and back to total price. Large sums seem small when you spread them over 60 payments. So if that’s how you’re negotiating, you do not have the upper hand. You could easily end up paying way too much for the vehicle and end up upside down (owing more than it’s worth) for a couple of years. Let’s try to bring the fun back into the new car buying process. Remember that you’re the customer and you can retain complete control over this process. Stay informed, hold your ground, and you’ll walk away with a great deal.